System Preferences will cast a shadow over the preference panels that don’t contain what you’re looking for, and a very obvious spotlight onto the preference panels that do contain the terms. Even better, you can actually navigate in the search box to jump directly to the preference option, even if it’s buried several options and tabs deep within a panel. 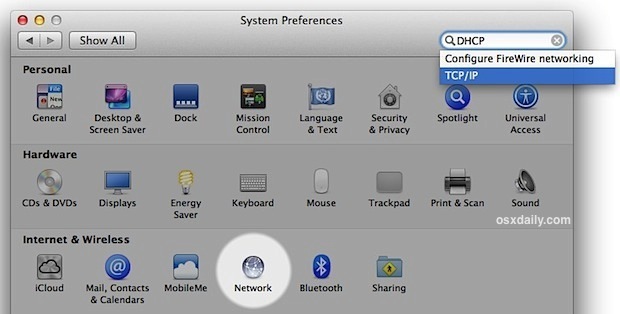 In the example screen shot, we’re searching for “DHCP”, which is set through a tab in a sub-preference panel for TCP/IP, something that if you’re new to the Mac you may not know. This works with a wide variety of things that are both obvious and not obvious, and it will even find non-exact phrases like “Lock Screen”, which will match up to the security panel where the “Require password for sleep and screen saver” feature is enabled, despite not even coming close to sharing the searched phrase.